Create your own beautiful table setting! Our designed table displays all of the basic elements that you need to create an amazing look. 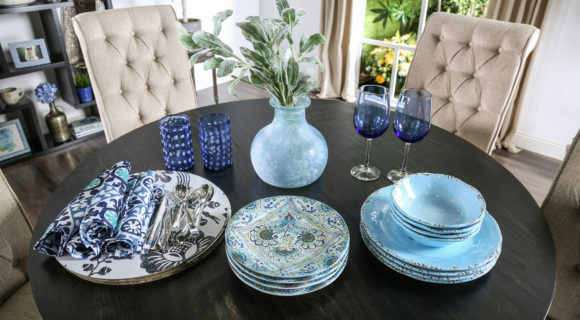 Blue, rustic dinner plates, matching bowls and patterned dessert plates are nested together to add height and volume. When shopping, choose one item that you love and build on it; finding items that complement each other. Create a table that pops by mixing patterns; use colorful napkins, woven, nubby or patterned placemats in lighter and darker variations of your color. We built our look starting with round placemats in a vintage bird pattern, then added colorful dishes, glasses and accessories. A vase with willowy stems in a mossy green basket with rolled colorful napkins adds height and makes a trendy statement. Be creative and unconventional with silverware; lay the knife by the plate and cross the spoon over the fork in any format. All of these items can be found at local discount home stores at affordable prices. Get creative! This entry was posted on May 1, 2017 by FOA Team. Excellent and beautiful ideas for decorating the table, placing the plates and wine glasses around a central flower pot is great!